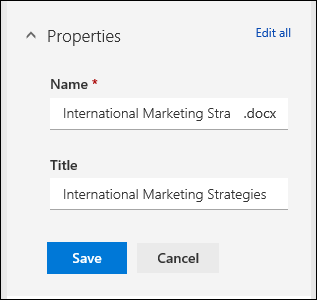 In the information pane of a SharePoint document library, you can see all of the properties for a file, folder or link. Depending on permissions granted to you by your administrator, you can view or edit the file name, which by default is the filename you originally uploaded, and the title that you can make more descriptive. You can also view a thumbnail image of the item's content. Note: The number of properties available to view and edit for a file, folder, or link can vary depending on which properties the item owner or your administrator has assigned to it. Some of these properties may be required. Go to the document library that contains the file, folder, or link for which you want to see information. If your library is displayed in list view, click the icon to the left of the file, folder, or link to select it. If you're in thumbnail view, click the top right corner of the image of the file, folder or link to select it. In the top right corner of the document library page, click to open the information pane and view the information for that item. Does your screen look different than this? Your administrator may have classic experience set on the document library. To view the information about an item when in classic experience, right click the item and select Details. Go to the document library that contains the file, folder, or link you want to edit information for. Click the icon to the left of the file, folder, or link to select it. If you're in thumbnail view, click the top right corner of the file, folder or link to select it. In the top right corner of the document library page, click to open the information pane. Click the value of the property you wish to edit under the property name, type the new value, and then press Enter on your keyboard. Your change will automatically save. To edit more than one property at a time, click Edit all, edit the properties you want to change, and then click Save. Note: Does your screen look different than this? Your administrator may have classic experience set on the document library. To edit the information about an item when in classic experience, right click the item, select More and then select Edit properties.